If you come across a fixed-price listing on eBay and you’re in the mood to negotiate, why not make an offer? 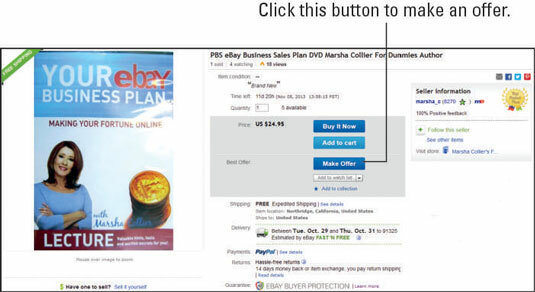 Sellers on eBay can use the Best Offer option any time they list a fixed-price item. When the seller selects this option, you’ll see the Make Offer button on a listing, which should indicate to you that you’re dealing with a seller who’s motivated to sell. This is a great way to get bargains. You make an offer on the item and the seller will either accept your offer or send you a counteroffer. Making an offer to buy an item has a drawback: The seller has 48 hours to respond to you, and you may find the same item from another seller at a better price before then. By making an offer, you guarantee that you will buy the item at the price of your offer if the seller agrees to it. If that doesn’t happen, you’re off the hook and can find another of the item elsewhere. To make an offer, click the Make Offer button (rather than the Buy It Now button). When making an offer, you might think you want to put in a really, really low offer. But be sensible; if the item is new, the seller may have only a little wiggle room on the price. Also, putting in a ridiculously low offer (say $10 on a $25 item) may just annoy the seller and he or she may turn you down without giving you an opportunity to negotiate.